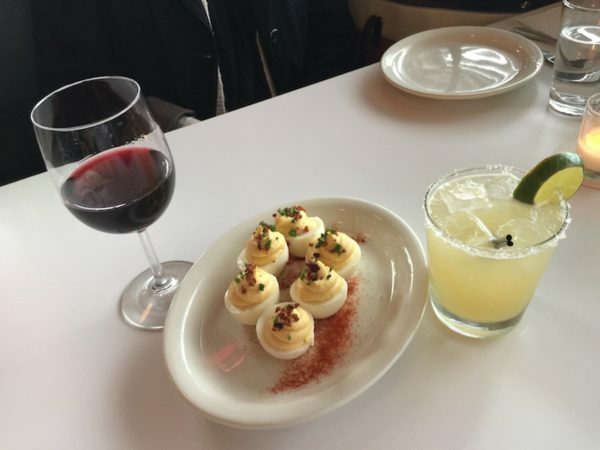 National Deviled Eggs Day? You’re kidding! I couldn’t tell you who started National Deviled Eggs Day — perhaps someone in the egg industry. I can tell you, though, that I love them! Depending on where you grew up, you might call them “stuffed eggs,” “dressed eggs,” or “salad eggs,” but here in Maine most people refer to them as “deviled eggs.” This ap-peel-ing appetizer is having a bit of renaissance these days, and you can find various versions on the menus of some of the hippest restaurants in Portland. Some places feature different preparations every day! Although they weren’t prepared the same way, the roots of modern-day deviled eggs can be traced back to ancient Rome, where eggs were boiled, seasoned with spicy sauces and then typically served at the beginning of a meal—as a first course known as gustatio—for wealthy patricians. Chopped bacon and chives atop is always a good idea. If your eggs are very fresh, heavily salt the water to ease in peeling. Experiment with different cuts rather than the traditional long halving. From a nutritional standpoint, eggs are rich in protein and low in calories. However, all of the egg’s saturated fat and cholesterol is in the yolk — add some high-fat mayonnaise and the incredible edible egg becomes a little less good for you. Other healthy alternatives are light mayo or light sour cream. Or try this: Add 1/3 cup plain Greek yogurt, 2 tsp. dry mustard, and 2 tsp. vinegar (or freshly squeezed lemon juice) to the yolks and blend them up. You can also get creative by adding your own special seasonings. Try hot pepper sauce, sweet pickle relish … or what about Maine lobster? Happy National Deviled Eggs Day, everyone! How do you like your deviled eggs? Do you have a secret ingredient you’d like to share with a few friends? !